Centradenia grandifolia is a tender shrub and will be an annual in inland gardens. 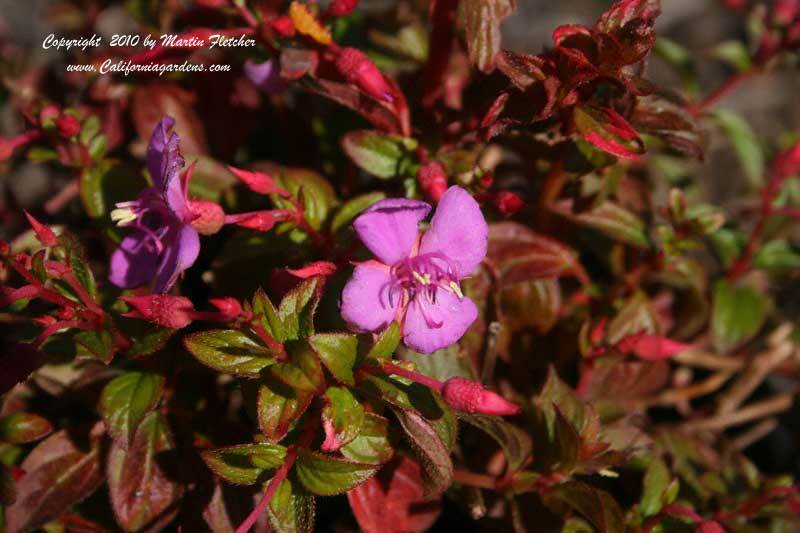 But where the frost is light, the foliage bronzes to red and the bright pink flowers make a lively color clash. More than a light frost is catastrophic. Centradenia grandifolia grows to 2 feet tall and across. The Trailing Princess Flower is native from Mexico into Central America. Some are calling it Spanish Shawl, and Trailing Princess Flower. Centradenia gandifolia will grow in full sun to light shade. Expect frost damage with even a light frost and root kill at 25°F. Flowers and foliage of Centradenia grandifolia - Trailing Princess Flower or Spanish Shawl. High resolution photos are part of our garden image collection.